Just Sold at Le Club International! 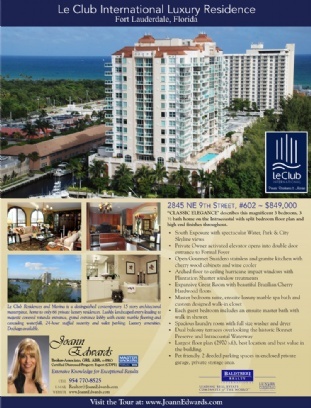 Le Club Residences and Marina is one of the premier luxury waterfront condominiums that I am fortunate to represent. Within the Broward County Real Estate marketplace, Le Club is one of the most fiscally stable buildings and its units have been rising in value since fall of last year. Broward County has witnessed a dramatic reduction in inventory, and Le Club has also experienced a reduction in its inventory due to the sudden increase in pending sales. Reasons buyers continue to purchase at Le Club are its beauty, with 15 stories of impeccable design, boutique style exclusivity, with only 64 luxury residences, and its amenities, with 24 hour staffed security, lush landscaping, rotunda entrance with marble flooring and waterfall grand lobby, 4th floor waterfront pool deck with 2 separate sun plazas, outdoor kitchen, spa, and state of the art women’s and men’s fitness facilities. It is with great pleasure that I report that residence 602 has just sold for $765,000. This residence was listed originally for $849,000 and the buyer, a realtor, gave up his commission to secure the lowest possible price for this incredible residence. Residence 602 is a 3 bedroom and 3.5 bathroom luxury condominium, offering the largest floor plan and most desirable location in the building, with southern exposure over the Bonnet Preserve. The views boasted by this residence are of the Bonnet Park Preserve, City Skyline, and the Intracoastal waterway. Within its 2,970 square feet, is a completely remodeled home, with every possible upgrade and amenity. The open European Snadeiro Kitchen is chef ready with stainless steel Kitchen Aid “Architect Series” appliances, cherry wood custom wood cabinetry, granite countertops, backsplash, and wine cooler. The great room includes Brazilian hardwood floors, floor to ceiling arched windows with elegant plantation shutters, 9 foot ceilings, and opens to its own balcony terrace, perfect for enjoying the views. Within the expansive master suite opening onto another balcony terrace , is an ensuite spa with marble vanity, frameless shower, and a Jacuzzi whirlpool soaking tub; and a custom designed walk in closet. Guest bedrooms also include ensuite baths with walk in showers. Multi Zone air cooling systems insure the comfort of all residents and guests, and the laundry room has full size washer and dryer. For the convenience of residents, every unit includes two deeded parking spaces in an enclosed, gated garage, and a separate storage unit. 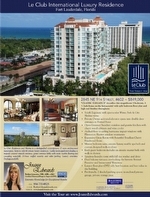 This truly was a spectacular residence and I was very pleased to represent the seller in this transaction. For more information on purchasing residences at Le Club International, or to find our more information on selling your residence at Le Club International, Please contact me today!